We can do better than only reading nice description of a better life: we have a mean to actually live it! Or nearby: virtual worlds. Today virtual worlds allow for building and showing wonderful landscapes, and also for like-minded people to meet and share our lives in these places. It costs only a few, save a good computer with a decent graphic card and a correct ADSL Internet connexion. You may have heard of Second Life, and a lot of nasty things about it. The other worlds that I describe here user the same technology, but they are unrelated to it. Virtual worlds look like multi-players Internet video games, but with a fundamental difference: there are no imposed theme, rules or activities. Right on the contrary, it is up to us to create our own places and to build our own decors, with the proposed tools, and to set the theme and activities we want: creativity, art, education, spirituality, discussions, friendship, love... This makes that virtual worlds are growth places, and even educational places (children, teens) instead of a mindless loss of time as many video games are. Inworldz (and the defunct SpotOn3D) is the only virtual worlds where we can create and have our Intellectual Property protected. This made it the most popular for artists and creators. -I am active today in Inworldz. 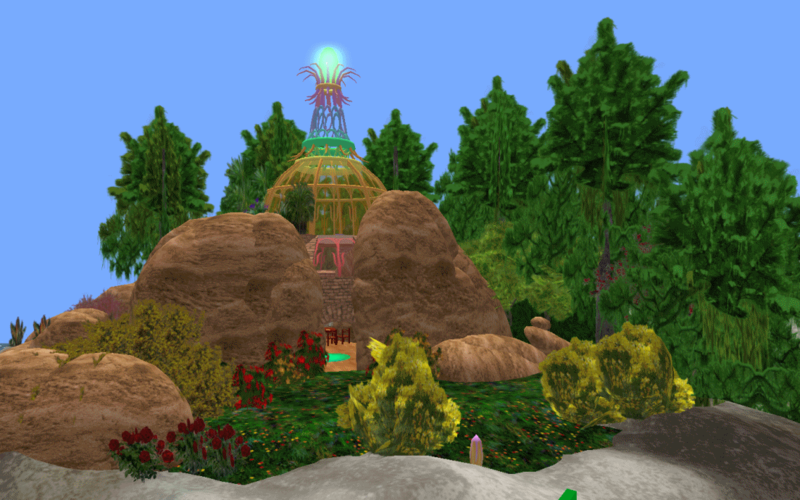 Download and install the Inworldz viewer here. Once in the world, mentors can help you learn the basics: speak, walk, exchange private messages, search for places, and teleport toward them. -Once in world, you may not find people in the places you like. This is because they cannot be online 24/7 (just like you) and virtual worlds are still in the beginnings. So that you need to be patient: virtual worlds are not media where we sit and «receive content»: it is up to us to create content, after our purposes and ideals. My virtual name is Yichard Muni. I created an Elf group «Elf Dream» and several sub-groups: «La Tribu d'Elfinesse» (french speaking) «Elfin Love Tribe» (love) and «Elven Bards and Storytellers» (stories and evenings). I also created a group to discuss General Epistemology: «Shedrupling University». These groups exist into Inworldz, Second Life (not recommended), OpenSims, zandramax, facebook (not recomended) and LinkedIn. 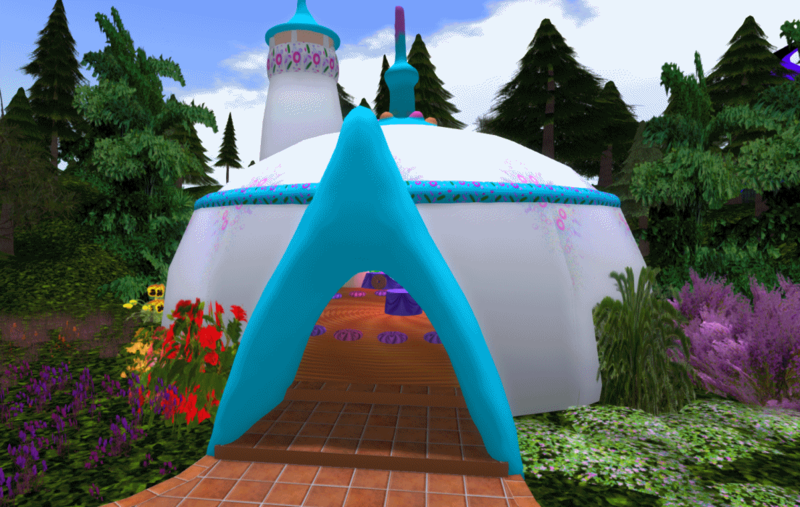 However «Elf Dream» is active only into Inworldz. If you are in facebook, you can friend me as «Richard Trigaux» to receive invitations for events. This was a mandala, a vision of paradise, made for an «Elysium» event on the afterlife. It was build from «prims», predefined shapes like cubes, spheres, etc. An elven home into rocks, also made for an event on «wishing». 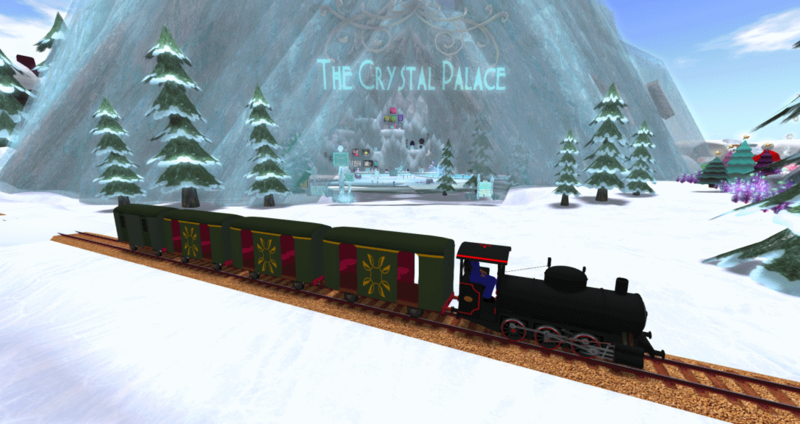 I also made a working train for the Winter Gala 2013, running throughout the event. In the background is the main meeting hall. 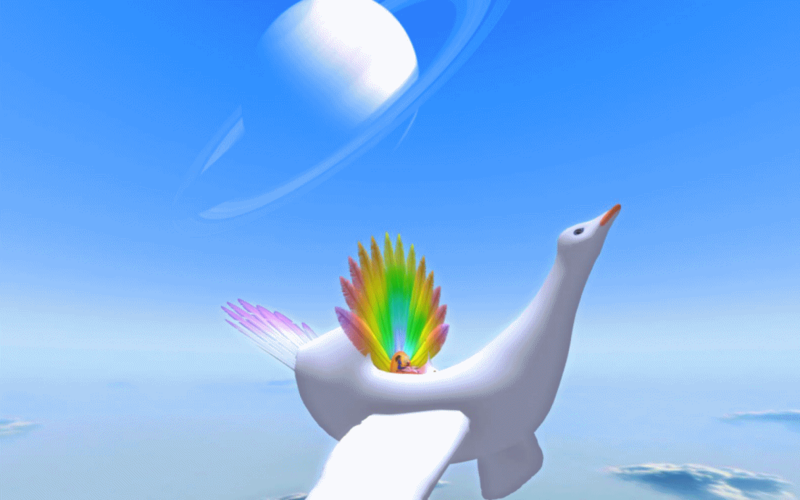 This goose wanderer was floating and swaying in an alien sky... It was made for the Wings Festival in 2014. Note this time the use of a newly available technology: meshes, which allow for random curved shapes. This is the altar of the above elven temple. It is dedicated to Shelenaë, the elven goddess of My stories of the Elves of the Dauriath. 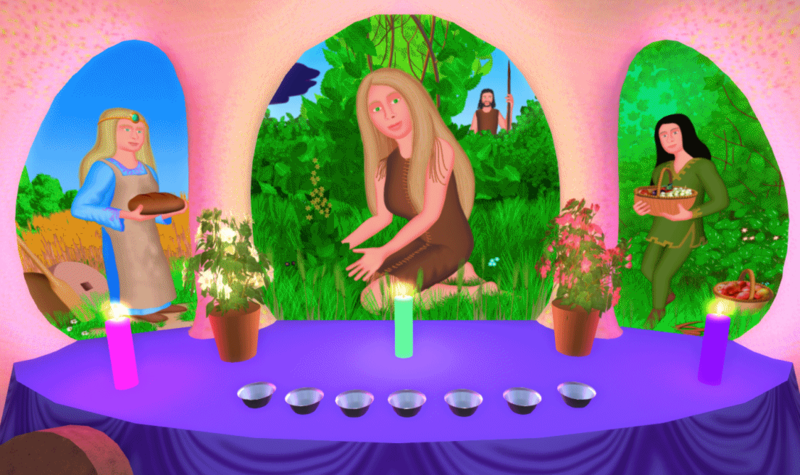 Being the goddess of farming (among other things), she is represented with these activities. This altar was served daily along the event, like a real one. Note the mesh shapes of the walls and offering bowls.